The Oxygen provider course represents entry-level training designed to educate divers and interested non-divers to recognize potential scuba diving injuries, and to provide emergency oxygen first aid. Emergency oxygen should be provided for an injured diver while activating the local emergency medical system (EMS) or other similar local procedure and arranging for transportation to the nearest available medical facility. The objective of this course is to educate divers about diving injuries and to train them to use oxygen while providing other assistance. This course will introduce you to the fundamentals of dive accident recognition, response and management. Providing emergency oxygen to simulated injured divers. Operating the Oxygen Unit and using oxygen delivery devices. Identification of the main components of the Oxygen Unit. 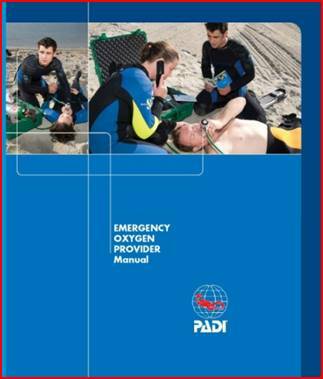 The PADI Oxygen Provider Course is not designed to train lay persons to provide oxygen to the general public. While the medical standards and equipment are the same regarding the emergency use of oxygen for both divers and non-divers, the Oxygen Provider course does not prepare individuals to respond to the ill or injured member of the general public by using emergency oxygen. Certification Recommended for Rescue Diver & All Professional Ratings. Only a Desire to Learn!